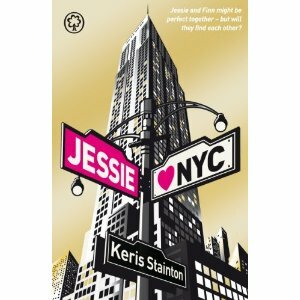 "Jessie's just arrived in New York, hoping to forget about her awful ex. They might be perfect together, but in a city of eight million people, will they find each other?" This really cool book was lent to me by the fabulous Laura over at SisterSpooky: Book Fangirl. She read it and really enjoyed it, so sent it my way. And what a fun read it was!! Firstly the cover is pretty darn awesome. I love the Gold shininess - you really cannot make things shiny enough!! And set with the New York landscape, its so eye catching. I was really impressed with its style!! The book is full of pop culture references, which for an all things entertainment fangirl like I am was so cool. I wanted to say to the characters 'OMG I thought that' or 'I LOVE HIM TOO!!' I was rather thrilled by mentions of Jared Leto (YUM) My Chemical Romance (MCRmy) & Ugly Betty (she is like my sister from another mister!!) My only slight concern is that this book won't have as long a shelf life just because in a few years people may not know how epically cool the people / things are that are written about. I hope that’s not the case or if it is that it will educate people in the future on some awesome bands & TV that they have to check out!!! The story is told from two perspectives - English Jessie and American Finn. It was so enjoyable reading from both sides and seeing the use of language for both. It’s amazing the differences that there are in our day to day speech!! 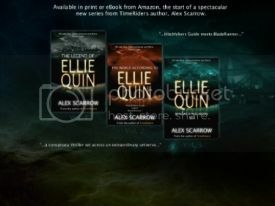 For instance Finn describes the girl he really fancies and says she is a Size 10, straight away I was thinking, so is that US sizing as he is American or is that UK as the book is highly targeted at the UK audience. In the end I had to ask Keris herself. She did confirm that is was US sizing, so the girl was a UK 14 - another thing that really impressed me - not all desired girls have to be a size 8!!! There were parts to the story that I found a little convenient or just unlikely but put that aside this is a really fun and quirky book. For me the story was quite similar to the movie 'Sliding Doors' The way that Jessie and Finn are constantly thrown into similar places and situations, yet both being so focused on their own life’s they don't see each other. For me this book was essentially about fate and I found that really comforting and hopeful for life and future. Highly recommended for a quick fun read!! I totally agree, such a fab read! Made a really nice change to my ususal paranormal deep and dark reads! !